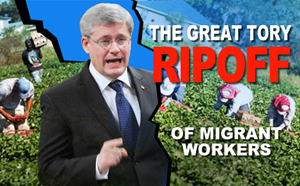 Once again, the Stephen Harper government has viciously attacked migrant and temporary workers in Canada. In spite of the fact that migrant and temporary foreign workers pay millions of dollars every year into the Employment Insurance (EI) fund, they have now been cut off from receiving the EI Special Benefits their premiums pay for. Seasonal migrant agriculture workers alone pay more than $25 million in EI premiums , but they and other temporary workers have now been essentially barred from receiving benefits that other workers in Canada receive. It is the Great Tory Ripoff of Migrant Workers. It is like being forced to buy mandatory auto insurance but you are excluded from coverage. The Great Tory Ripoff of Migrant Workers was announced by Diane Finley, Minister of Human Resources and Skills Development without consultation, notice, or right to appeal. It is grossly unfair, not in keeping with Canadian values, and the latest blow by the Harper government against some of the most vulnerable workers in Canada. Send a message to Minister Finley to Stop the Great Tory Ripoff of Migrant Workers by dropping the abusive EI changes that blatantly discriminate against migrant and temporary foreign workers.